A few years ago Union Camp turned a corner. Management decided that advance planning would take the place of reacting after the fact to an emergency or regulatory agency demands. At Union Camp’s Dover, OH. facility, byproducts of the paper industry are converted into usable specialty chemicals for cosmetics, adhesives and other industries. Crystallization is a process used intensively with cooling provided by an ammonia refrigeration system. One of the particular concerns at the plant was the possibility of a catastrophic release of ammonia. With receivers, condensers, surge tanks, and accumulators for the chillers, coolers and filtrate recycle subcoolers, there are approximately 35 safety/relief valves which could “blow.” Conceivably several could blow simultaneously. During a release both liquid ammonia and/or ammonia vapor would be encountered. Based on the largest valves in the system, a single-valve release could discharge approximately 315 Ibs. of liquid ammonia in two minutes (157.5 Ib/min., equivalent to about 3500 acfm of vapor). The worst-case ammonia release would occur during a plant fire, with pressures rising and relief valves “popping.” Once liquid ammonia is released fire fighting becomes infinitely more difficult. The aim was to ensure that this problem would never arise. An emergency ammonia release plan was therefore, needed. Part of the plan involved obtaining the proper safety equipment and training personnel in its use. Just as important was the attempt to contain and control the released ammonia. A six person Ammonia Project Team was created to come up with a practical solution. The plan was to “cap the well” pipe all relief valves into a header designed to accept discharges from several valves at once. The header would lead the discharges to the treatment equipment. 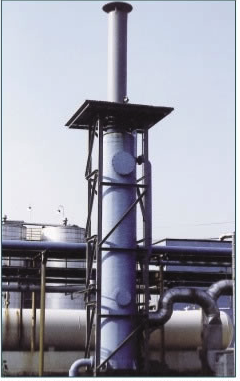 Since ammonia collection points are spread around the complex, in the compressor building, the solvent building and other areas, it became evident that the scrubber should logically be located outdoors. With all these preliminary factors determined, the next step was to find the optimum treatment system. Choosing The System: In discussions among Union Camp personnel and with the Clean Air Group, LLC representative, the choice for a scrubber was narrowed to a Jet Venturi (ejector scrubber) or a packed tower. The Jet Venturi requires more energy input than the tower, and is less efficient: its efficiency peaks in the low to mid 90s where a tower offers 99+% ammonia removal. On the other hand, the tower does have a more limited turndown, so ensuring its effective performance over the desired wide range of operation requires considerable technical expertise on the part of the supplier. The representative proposed the Clean Air Group, LLC Technologies as the supplier. 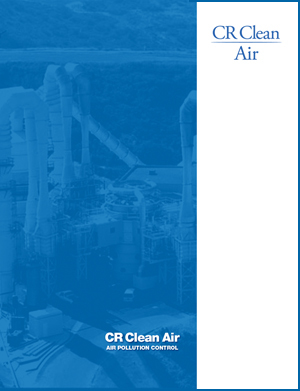 Since the Clean Air, LLC Technologies designs and supplies both types of scrubbers, singly and in combination, they could provide an objective view of the merits of each system. The supplier also provided customer references for ammonia scrubbers and emergency (chlorine) scrubbing systems. Ultimately a packed tower design was selected as the scrubbing method of choice. Use of once-through water for scrubbing was preferred for several reasons. Without the need for the pump, controls, valving, etc. required for a liquid recirculating loop overall design, installation and maintenance are simplified. At the same time the absence of these components minimizes the chances for malfunctioning, an important factor for consideration, particularly when a system must be ready to handle an emergency at any time. Corrosion resistant materials of construction, such as FRP fiberglass for the column shell and polypropylene for the tower packing and mist eliminator, were chosen to ensure reliability and long life. Basic design of the packed tower type scrubber is counterflow. The stream of gas to be scrubbed enters the bottom of the column and works its way upward through a bed of randomly dumped packing designed to provide a high surface area. The scrubbing liquid is distributed through a full-cone spray nozzle over the surface of the packing and flows downward by gravity countercurrent to the gas. This allows the fresh water to contact the exit gas having the lowest ammonia levels, assuring optimum mass transfer and resultant ammonia removal. The tower diameter, bed height and packing type were selected to provide the required performance without excessive pressure drop, and taking into account turndown considerations. Ammonia removal efficiency is rated at 99+% for the minimum single valve release and well over 90% for the entire range of operation. Detecting Release: There was another important consideration related to the control/safety system. A reliable method of detecting a release in order to activate the scrubber was needed. After considering various types of sophisticated in-line sensors, a simple but very reliable solution was found. 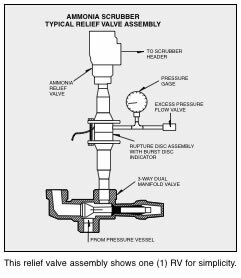 A rupture disc assembly is inserted in each riser between the pressure source and the ammonia relief valve. A burst disc indicator shows when the disc has ruptured, triggering annunciation and activation of the scrubber. After some time on the job, both the scrubber and detection system have performed well. It is evident that the system is working. Although there have been some occasional ammonia releases, none of the facility’s ammonia sensors have alarmed, although the plant sensors are sensitive enough to pick up 50 ppm of ammonia at 100 ft. from the source. False alarms have also been minimized. Techniques have been developed at Union Camp for application of these sensors to eliminate interference by hydrocarbons and acetone which are normally found in the plant environment. A redundant ammonia detection system involving cross-linked sensors is also planned. Two sensors will have to be activated before the emergency system goes into effect, although a single sensor alarm will still be cause for investigation. Union Camp’s Dover plant has made a major investment in areas of detection, containment and control of gas release. The company has also emphasized personnel training in the use of proper equipment, including periodic unannounced alarm/tests. The philosophy is “contain, ventilate and clean up.” With the investment of time, money and careful advance planning, if an emergency does occur, Union Camp will be in the best position to contain and control.